Georgia Southern University will participate in International Fraud Awareness Week – Nov. 15-21. 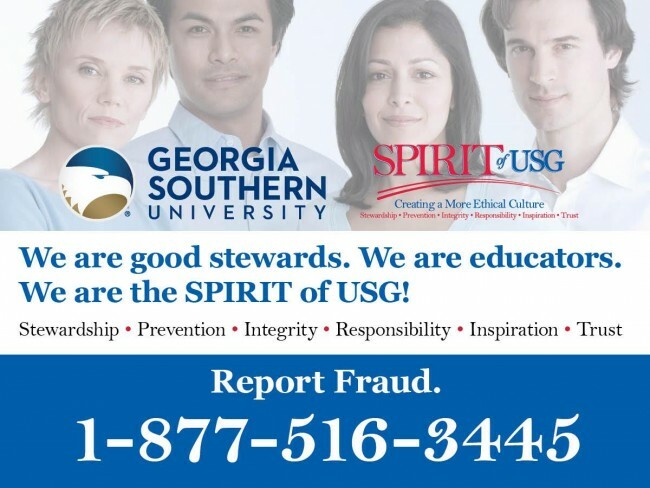 It is part of an effort by the University System of Georgia to promote an ethical culture and to bring awareness to the common and uncommon instances of fraud or ethical violations within the campus community. “Fraud, waste and abuse directly impact our stewardship responsibilities, and the well-being of individuals within our campus community,” said Jean Bartels, Ph.D., R.N., interim University president. Throughout the week, the campus community will receive video messages from President Bartels, and such offices as Public Safety, Human Resources, Finance, Information Technology and Academics on stewardship, prevention, integrity, responsibility, inspiration and trust. In addition to video messaging, posters and digital signage will be visible across campus and all faculty and staff will receive a tip card with reporting information. For more information on Fraud Awareness Week, or to report a fraud or ethical violation, visit GeorgiaSouthern.edu/reportfraud or call 1-877-516-3445. Members of the public are also encouraged to report.